Naomi Wright and Hardee T. Lineham discuss the drastic facial reconfiguration of David Jansen's Lette in Theatre Smash's production of The Ugly One. Photo by James Heaslip. German theatre has gone over really well in Toronto in recent years. Playwright Roland Schimmelpfennig’s contribution to Volcano Theatre’s Africa project was widely praised, and twinwerks//zwillingswerk’s production of Felicia Zeller’s Kaspar and the Sea of Houses earned the company an outstanding production award at the 2011 SummerWorks (and a trip back to 2012’s festival). Now, Theatre Smash returns with Marius von Mayenburg’s The Ugly One, a clever slice of absurdism that works well on several levels. There’s light humour when the titular character discovers that everyone finds his face repugnant, and darker tones when his new, beautiful face becomes coveted obsessively by those around him. Let’s turn around and head back to the beginning. (About face! Sorry, we couldn’t resist.) Lette (David Jansen), the play’s protagonist, is a successful engineer (and happily married man) who can’t figure out why his boss (Hardee T. Lineham) refuses to allow him to present his new invention at a conference, sending his assistant (Jesse Aaron Dwyre) instead. The truth is eventually revealed: Lette has gone through his whole life without anyone telling him that he has a uniquely ugly face. Even his wife (Naomi Wright), who professes to love him dearly, won’t look him full in the face when they speak. Faced with this revelation, Lette seeks out an innovative plastic surgeon (Lineham as well) who gives Lette an entirely new and breathtaking countenance; but when the surgeon begins using Lette’s popular new look as a template for all his work, the changed man’s sense of self becomes increasingly unhinged. Jansen (who co-directed Kaspar and the Sea of Houses), as the initially hardworking and decent Lette, does a fine job of the everyman role. Lette’s slow realization of how the world views his face is a treat to watch; he’s more bemused than stricken at the idea that he’s considered hideous. When he’s turned into an Adonis by the surgeon’s skill, he slowly begins to revel in his new status, and the admirable character traits he once possessed begin to be replaced by vanity and entitlement. It’s to Jansen’s credit—and to the credit of his co-stars, too—that we never question either of those extremes, without any makeup or trickery. It’s Lineham, though, who does the most convincing work in the show, setting up the skewed perceptions that dictate this off-kilter image-obsessed world. That might be in part because his two characters alone display no attraction to or obsession with Lette’s new look, treating it purely as a commodity. But it’s also that the veteran actor’s straightforward line delivery elicits some of the biggest laughs, as both the savvy businessman and egotistical surgeon manipulate Lette’s changing fortunes to their advantage. The actors play in the round, around a large table that doubles as an operating room, salon, presentation stage, and more, smartly lit by Jason Hand and designed by Camellia Koo (who also designed the costumes). Director Ashlie Corcoran has done a good job with the staging, and particularly with the use of apples (as evidenced in the poster design) as a motif; the fruit is carved and diced throughout the show, and put to especially good use in the surgery scene. The show has some pretty thought-provoking points to make about identity and self-perception, but it does so with plenty of winks and sly nods. As a parable, it’s not saying anything particularly new, but it is putting a good face on some clever ideas—so to speak. 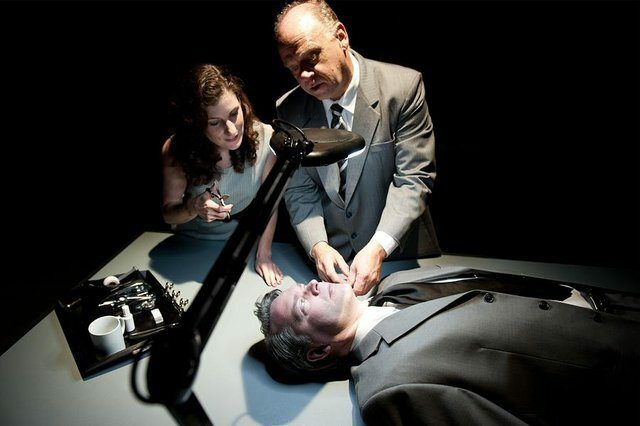 Editor’s Note: This review originally appeared for Theatre Smash’s 2011 premiere of The Ugly One at Tarragon Theatre. The current remount features the same cast and creative team.